When it comes to pre bonded hair extensions, the only way is Keratin. Not only does it make for easy removal, but Keratin is also ultra kind to your hair - ensuring the extra length and volume doesn’t damage your natural hair. Combined with truly stunning 100% human hair, your new ‘do will be just like you, but better. 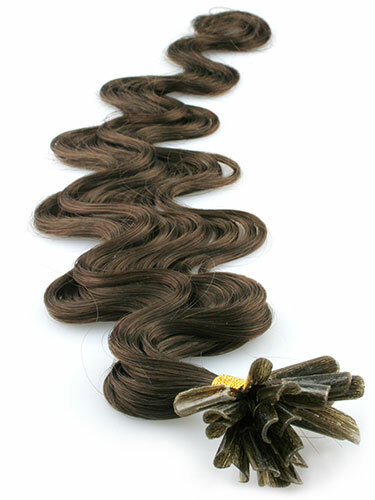 Treated in the body wave style, these human hair extensions are extra sassy. Not only do you get all that added hair, but you’ve got the curl to go with it. Just choose your colour and you’re good to go. These locks are glossy, shiny, and as soft as you like, but you’ve got to treat them good to keep them looking good. That body wave might look impressive now, but it will drop the more the extensions are washed and straightened, so be sure to care for the curl if you want to keep it. This hair is gorgeous to look at.. the color is beautiful, it's soft and the wave is so pretty.. not too tight. However, I'm incredibly disappointed.. I had it installed a couple days ago and it's constantly tangled!! I braid it at night then wear it down during the day.. I gently brush it out in the morning and I've used hair oil it to see if that helps.. nothing is helping! I'm so angry I spent so much money and it's always tangled. :( Thankfully, The woman who installed it did an amazing job.. but I would never buy this hair again. I have very dark brown eyes .I recieved my order of colored lenses today put them in and I have to say they are a great fit and I strongly recommend these to anyone wanting to enhance eye color and for it to look natural.I have tried many different brands but, I find these to be the best so far.I was happy to have recieved a full bottle of solution and a new case with my shipment too!I am planning to buy mutiple colors with my next order.Thank you HairTrade!